Reputed to be the oldest hotel in Heidelberg, Die Hirschgasse has been welcoming travellers since 1472. Of all those to have passed through its doors, Mark Twain and Otto Von Bismarck are arguably the most notable. It is said that the former visited on several occasions in 1878, and makes mention of the place in A Tramp Abroad. Bismarck’s connection appears to relate to the fact that he fought duels at Die Hirschgasse, mainly on account that it was a former “duelling house”, and reputedly the oldest in the whole of Germany. Today the hotel features 20 guest rooms in all, including a small number of suites. 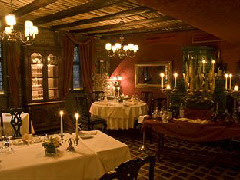 It also possesses its own restaurant, Le Gourmet, as well as the Mensurstube Tavern.